Heat 2 table spoons of oil in a pan. Fry rai, jeera, urad dal and chanadal. When the dals turn to golden color remove them into a bowl. In the same oil fry green chillies and red chillies separately and keep the in the bowl. Let them cool. Now add a table spoon of oil in the same pan. Put the amlas in the pan. (Wash and wipe the amla before using) Sprinkle little salt and close the lid. Cook in a medium flame for 5 mins. Add tamarind to it and cook for few more mins until the amla is properly cooked. Switch off the flame and let them cool. Now slowly press the alma and remove the seed inside it. You can see in the above pic. 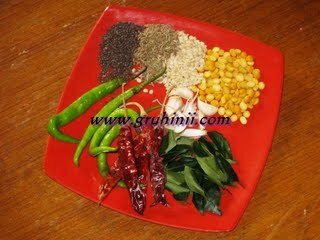 Now grind the fried ingredients (rai,jeera,urad and chana dal), green chillies and red chillies to fine powder in a mixie. 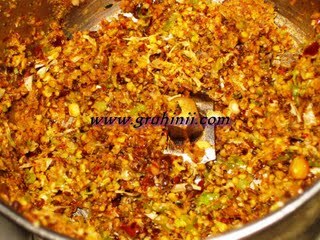 Now add red chilli powder, salt, sugar or jaggery, garlic pods and tamarind and grind once again. Now add the amla pieces and grind coarsely. (Taste and add little more salt and red chilli powder if necessary) No need to add water. Take the chutney into a bowl.